The intention of the FIA's rules regarding fuel meant that the races would help to explain what had happened in qualifying. There were plenty of mysteries to be explained after the action in qualifying with several cars looking much better than had been expected. Were they running light fuel loads or could they really go that quickly? The race would tell us. Or so we thought. The depressing thing was that it looked as though Ferrari was completely dominant again. And the early part of the race seemed to confirm this but the picture was clouded by the weather which meant that some of the drivers had to pit to change tyres because of a damp track at the start. And that meant that when the race ended there were still many questions to be answered. The impression left was that Michael Schumacher should have won the race but was unlucky with his choice of tyres and with damage to his car but when you looked a little closer the picture was much more complicated. The tyre choice enabled the two Ferraris to lead in astonishing fashion in the early laps. The two drivers were pushing hard until Rubens Barrichello, who had jumped the start, made a mistake and crashed heavily the high speed corners at the back of the Albert Park circuit. Soon after Barrichello shunted Schumacher came screaming into the pits. He took on fuel and new tyres. There was a hold-up with the left rear tyre and Michael lost a few valuable seconds. That fuel load, plus whatever he had in the car, took him to lap 29 and then he took on more although it was quite a quick stop. Michael seemed to be on his way to victory when he ran over a kerb and damaged his barge boards. They were hanging off the car in a dangerous fashion and on lap 46 Michael was ordered into the pits by the Race Director. And this was when we were given a clue. The car was refuelled. The team later confirmed that this was part of an aggressive strategy to make up for the time lost because of the tyre choice at the start. The thing that was clear was that if the strategy had happened as planned the team would not have won. Ferrari would have been beaten. The barge board problem disguised that. Applying this information back to the qualifying session one might easily reach the conclusion that Ferrari was running its cars very light in qualifying in order perhaps to demoralise the opposition. The speed of the two red cars in the early laps was startling but was that due to the tyres or the fuel load? In the end there was no definite way of knowing. And that means that we do not really know if the Ferrari is as good as it seemed or whether the rival teams have caught up. The race did reveal that both Williams and McLaren are pretty competitive this year but once again how competitive is not clear as the damp track and the choice of tyres stopped everyone getting a clear picture. The two teams adopted conventional strategies after McLaren has initial stops to change from wet to dry tyres After that the drivers in both teams made mistakes. 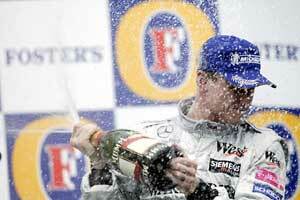 The man who made fewest mistakes was David Coulthard and he won the race. Raikkonen went off a couple of times; Ralf Schumacher had a slow pit stop and then a spin and a near-miss with Heidfeld and Montoya was bound for victory when he dropped the ball and spun on lap 48. It was a bad mistake for Montoya and he knew it and he apologised to the team over the radio. It was a victory thrown away. What the race did show was that the Renaults were running pretty light on fuel in qualifying. The chassis may be good but the engine is not and so the pace of Fernando Alonso and Jarno Trulli in the early laps was perhaps not	as impressive as it appeared. Once again the actual level of speed was obscured by the tyre issue. But one clue here seemed to give a lot away. Fernando Alonso pitted in the middle of a Safety Car interlude (a bad time to do it) and he dropped from second place to dead last as a result. And with a big fuel on board after that he did not figure and ended the race in seventh position. The only reason he would have pitted was because fuel was short and that must mean that he was running a light car in qualifying. Is the Renault really quick? A clue to this came from Trulli's performance. He was half a minute in arrears on what seemed to be a very conventional race and he made no obvious mistakes so perhaps this is the best indication that we have of the competitiveness of the Renaults. Trulli finished five seconds ahead of Heinz-Harald Frentzen, Alonso and Ralf Schumacher. The latter two had been delayed but Frentzen had had a sensible run with a two-stop race for Sauber. The first stop was brought forward because of the tyre issue but the plan was not badly disrupted. Heidfeld shone in the early part of the race but faded away when he had to carry a bigger fuel load. He disappeared on lap 21 with a broken right front suspension. The Saubers seemed to be pretty competitive. So too did the BAR-Hondas but their actual speed was hard to judge. Honda had some new engines in free practice but these expired and so a decision was taken to go for older more reliable units. The cars qualified remarkably well and gave a good impression but the race confused things because the two cars fell over each other. There was a lively battle between Jenson Button and Jacques Villeneuve early on. Both men had to pit early on to change from wet to dry tyres and Villeneuve went ahead as a result. But Jenson was right with Jacques and they were up to fourth and fifth when the second stops came. And then it went wrong. The big question was why. After the race Villeneuve said that his radio was not working properly and as a result he missed his pit stop and came in when Button was due. The team was taken by surprise because Button's tyres were ready and Villeneuve arrived. Both men lost time as a result but Button was feeling more than a little irritated by what had happened and in the final laps his chase of Villeneuve seemed to hint that perhaps he felt Villeneuve had stitched him up deliberately. The two men crossed the line nose-to-tail, with Villeneuve ahead, which indicated to anyone who cared to notice that Button had driven a harder race. "Jacques seemed unable to hear his radio properly," said team boss David Richards. Seemed? Was Richards trying to hint something? Would Jacques have deliberately stopped in front of Jenson and sacrifice the team's ambitions in order not to be beaten by his team mate? Clearly there were some who felt this had happened. Rival Toyota finished neither car but again there was potential shown. Panis struggled in the early laps with what seemed to be a heavy fuel load (although given his speed in qualifying this seemed a little odd) but as the track dried he came back impressively and would have a real contender for points had he not been given a drive-through penalty after going over the white line exiting the pits. This ruined his race and then he retired with a fuel pressure problem. Cristiano da Matta was running a different strategy and appeared to have more fuel than Panis but went off as he was trying to work his way up through the field as the track dried. "I know the car is quick," he said. Jaguar Racing's efforts also looked good early on. Mark Webber did a splendid job and ran as high as fifth until his car suffered a rear suspension failure and went out on lap 16. Webber's two-stop strategy was the right choice and he might have scored a decent result. The car clearly has some pace. Antonio Pizzonia continued to look a little out of his depth and also went out with a rear suspension failure. Jordan did not have a great day. Ralph Firman looked good as the track was drying but then went off and had a fairly big crash, ending his F1 debut. Fisichella had had a bad first lap because of the tyre choice and then ran over some of Firman's debris. He lost time because of a problem with the fuel flap in the middle of the race and retired at the end with a gearbox problem. Minardi managed to get Jos Verstappen home, although he was a lap down at the finish. The Dutchman had a bad day which began with an oil leak which meant that he had to go into the spare car, which was set for Justin Wilson. He started from pitlane but drove a good solid race with an ill-handling car. Wilson did pretty well in the early laps as others struggled but went out with a holed radiator. So did we really learn who is quick and who is not? Maybe Malaysia will be easier to explain. But does it really matter? The important thing for Formula 1 was that someone other than Ferrari won the race. From an image point of view the racers could not have done better.